After more than four decades, Orson Welles’ final film, The Other Side of the Wind, will hit the big screen. Having spent almost half a century inside a warehouse in a Parisian suburb, the 1,083 reels of film will finally be released and made available for screening by May 6th, 2015 – the 100th anniversary of Welles’ birth. Welles’ youngest daughter Beatrice, active heir and head of her father’s Estate, has maintained a tight lock on the film over the years, keeping it from numerous parties who have reached out for it, including Peter Bogdanovich, a longtime friend of Welles and an actor in the film. Bogdanovich had tried on numerous occasions over the years to obtain rights to the film in order to finish what Welles had set out to do. However, his attempts were continuously thwarted by the right holders over disagreements on how the final product should be reached. The film, shot over seven years, between 1969-1976, and never completed, follows Jack Hannaford, a struggling director looking to make a comeback in 1970s Hollywood. The script is said to be inspired by a dispute between Welles and Ernest Hemingway that occurred in 1937, when they met. Welles ultimately modeled the lead, Jack Hannaford, off of Hemingway, mimicking certain details of the famed author’s life throughout the film. Welles and Hemingway maintained an on-again, off-again friendship over the years. 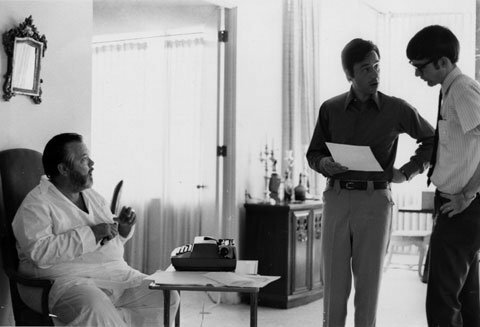 After Hemingway’s suicide in 1961, Welles was prompted to write a script that would later become The Other Side of the Wind. After extensive legal negotiations and a five-year discourse, the Estate, in conjunction with Iranian-French production company, L’Astrophore, and Welles’ partner and collaborator, Oja Kodar, have agreed to release the footage to Royal Road Entertainment. Bogdanovich will work alongside original line producer for the film, Frank Marshall, in editing the work. The two will do their best to imitate Welles’ complicated editing style, using the previous edit and script notes as a guide.